New York gubernatorial candidate Marc Molinaro’s Manhattan headquarters were vandalized earlier this week, his campaign said in a statement. 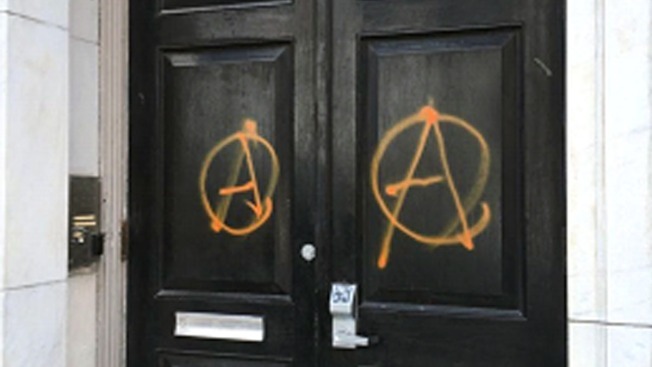 Photos from The Metropolitan Republican Club on the Upper East Side show two circle As -- a symbol commonly affiliated with anarchy -- spray-painted on the front doors. Molinaro, the Republican candidate challenging Gov. Andrew Cuomo, added that the building’s locks were glued shut and a threatening note was left behind. State Democratic party executive director Geoff Berman said in a statement that the party has "violence in our political system and condemn this latest act of vandalism." This type of divisiveness is repugnant to everything we believe as New Yorkers. That being said, Ed Cox and Marc Molinaro's rhetoric on this is wildly inappropriate. We need less hate and division – not more," Berman said.